One day, you told siri to call someone like you had done a hundred times before, but siri said there wasn’t any contact with that name, you touched the Contacts icon and momentarily got a screen with Contacts that immediately went away. There are no Contacts on your iPhone! Obviously, all the contacts are lost! It was definitely a terrible thing especially you have a large number of contacts stored in the iPhone and your iPhone has so much to do with work. At this time, you may just want to restore the lost contact on iPhone ASAP. iOS Data Recovery: a professional data recovery tool designed to recover the lost/deleted data from iPhone. How to restore iPhone contacts via iTunes backup? Step 3: Right-click on the iPhone and choose “Restore from Backup”. Note that this will effectively remove all current data on your iPhone and replaced by the previous data on the the backup files. If yes, you can now restore that lost contact easily. Step 4: After sometime, you should see the lost contact back on your iPhone. In case this doesn’t work, all you do is delete your iCloud account (but keep all data) Then add your iCloud account again, and still choose “merge” when prompted. 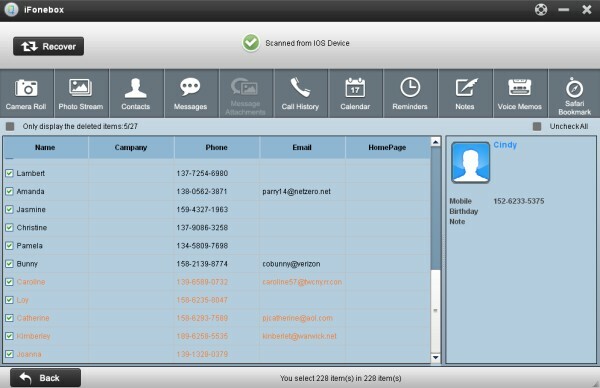 How to recover contacts on iPhone via iOS Data Recovery? I have to mention that the above 2 methods only work when you have backups, What to do if you don’t have backup? A third party tool is needed. Here I recommend iOS Data Recovery. iOS Data Recovery aims to help you recover lost or deleted data from iPhone with 3 steps. It supports iPhone 5/5S/5C/4S, etc. Download this powerful program for Mac & Windows by clicking below icons. Run Pavtube iOS Data Recovery; connect your iPhone to PC with USB cable. 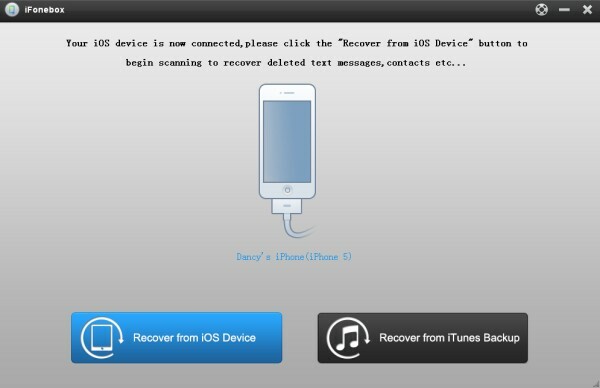 Then select “Recover from iOS Device” to start the iPhone contacts recovery job. You’ll see the window below. In the scanning result, you can easily preview all data found on your iPhone .Click the categories of contacts on the top side of the window. You can preview all the details of them. you can check box “only display deleted items”to only display the deleted contacts, so that you can quickly find out the deleted files and mark what you want to save them on your computer by clicking “Recover”. This entry was posted in iPhone and tagged get back iPhone contacts, iPhone contacts lost; restore iPhone contacts, recover contacts on iPhone, restore the lost contacts on iPhone, retrieve contacts on iPhone by IosdroneD. Bookmark the permalink.